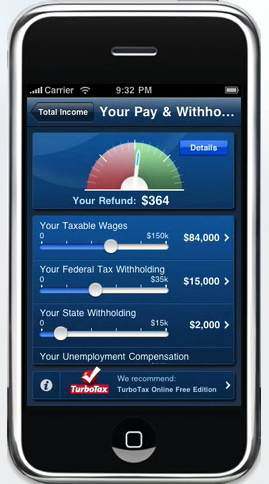 Tax prep on your iPhone? Really, it’s here. TurboTax gives us a sneak peek into the future of tax prep and offers an opportunity to test drive the latest concept at ShowStoppers CES 2010. Everyone at the station knows I like accounting and tax software and being up to date on the latest tax legislation, so when it came time to choose who would review the Intuit Tax app, guess who got voted in? Tax prep on your iPhone? Are we kidding? Nope it seems to be the future, but this reporter questions why. Intuit clearly makes the best tax software out there. Did you know Intuit also owns “Pro Series” used by professionals across the country? We all know Intuit owns Quicken the number one personal financial software hands down. But who wants to spend their time on their iPhone entering tax data? Certainly the ability to enter expense information “on the fly” into Quicken seems like it would appeal to a good number of people. But is doing your taxes on an IPhone app a reality? If Intuit has their way, it will be soon! The Intuit representatives were awesome and showed a glimpse into the future that made me think twice before dismissing such a novel application. In a simple world with a simple 1040 return it may make sense, but to trust a tiny screen to allow me to review such critical data seems just too risky. But for the consumer that goes on line and files their taxes using a Turbo Tax web based product, the IPhone app may have some appeal. There is no doubt that when I ask a colleague what they think, I always get the “are you kidding” response before the pros of such an application sink in. I will have to postpone my final conclusion until next year as this application requires an open mind and a bit more time to investigate. Now if all you want to do is estimate your tax refund or unemployment benefits, then that is a whole different story.